When looking up at the sky at night, it's easy to get the impression that the stars go on forever in fairly uniform fashion. We know, of course, that this isn't the case. Stars coalesce into galaxies, and galaxies join together to form clusters. And as for the vast, empty regions of intergalactic space, they don't go on for very long — the next galaxy is just around the corner. Except, that is, for one particular area of space known as the Boötes void, a massive expanse of empty space unlike any other observed in the Universe. Discovered by astronomer Robert Kirshner and his team back in 1981, the Boötes void, sometimes called the Great Void, is a huge, spherical region of space that contains very few galaxies. It's approximately 700 million light years from Earth and located near the constellation Boötes, which is how it got its name. The researchers originally published their surprising discovery in their paper, "A million cubic megaparsec void in Bootes." Soon after its discovery, astronomers began to notice just how incredibly sparse the the area really was. At first, they were only able to find eight galaxies across the expanse, but further observations revealed a total of 60 galaxies. Now, while that might still seem like a lot, it would be like stumbling upon 60 mile-long objects across across a region larger than the continental United States (and that's just in two dimensions). 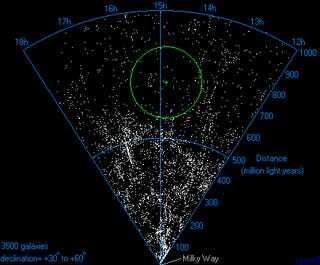 According to astronomer Greg Aldering, the scale of the void is such that, "If the Milky Way had been in the center of the Boötes void, we wouldn't have known there were other galaxies until the 1960s." Just for comparison, our own Milky Way has approximately two dozen neighbors in a region of space just 3 million light years across. 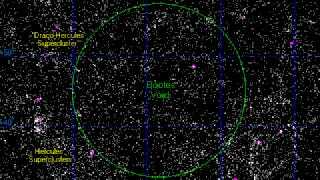 Looking at the volume of the Boötes void, it should contain about 10,000 galaxies when considering that the average distance between galaxies elsewhere in the Universe is a few million light-years. Scientists are obviously curious to know how such an anomalous region of space could come to exist. Computer models suggest that smaller voids, which are much more common, are caused by galaxies drawing closer to one another on account of gravitational attraction. This causes neighboring regions to empty out, and because the process is self-reinforcing, it tends to snowball. But this doesn't explain why the Boötes void exists, mainly because there hasn't been enough time since the universe began for mere gravitational forces to clear out a space of that size. The need for an explanation has given rise to a new theory, one which suggests that supervoids are caused by the intermingling of smaller ones. Aldring has noticed that galaxies inside of voids take the curious shape of a tubular structure — likely an important clue. In turn he suspects that the Boötes void is the result of smaller voids coming together, much like how soap bubbles coalesce to form a single large one. As for the tube of galaxies, that's likely the remnant of the boundary between the smaller voids. Those galaxies, speculates Aldring, are now stranded inside the supervoid. There is another, albeit more radical possibility — and one that has likely not been considered in the scientific literature. The Boötes void could be the result of an expanding Kardashev III scale civilization. As the colonization bubble expands outward from its home system, the civilization dims each star (and subsequently each galaxy) it encounters by blanketing it in a Dyson shell. This might also explain why the void has such a nice, spherical shape. Given that the void is about 700 million light-years from Earth, and that intelligent life could have emerged in the Universe about 4 billion years ago, this ancient civilization may have had enough time to perform this astonishing feat of cosmological engineering. Now, this is pure speculation, but it's worth throwing it out there as a possibility given the strangeness of the phenomenon. The nature of void offers some interesting food for thought. Visitors to the area would surely feel overwhelmed by the isolation, with its extreme distances between galaxies and blacker-than-black view of distant space. This extremely low density means that when a pattern of neutrinos enters in one side of the void, it looks exactly the same upon exit. Same goes for photons. Particles of matter, having much more mass than both photons and neutrinos, would of course get pulled towards the walls of the void. Because of this state-preserving property, the Boötes void may one day be seen as the ultimate time capsule - fire off a pattern of photons, only for the pattern to be rediscovered hundreds of millions of years later when it reaches the other side. Perhaps the Boötes void will serve as a proving ground for the high-speed dragsters of the future, moving at 99.99999% the speed of light. Its extremely low density would certainly be appealing to anyone who wants to set speed records without that pesky intergalactic dust getting in the way. Needless to say, the discovery of the void has thrown conventional cosmological thinking out the window. Since its discovery, astronomers have had to revise their notions of galaxy formation given what we now know about the extreme non-uniform distribution of matter throughout the universe. Finally, the Boötes void provides another humbling reminder of the vastness and sparseness of the cosmos. The universe that we see is too impossibly large for us to comprehend, our place within in it a tiny, insignificant microscopic spark. But all that said, and as alone as we may appear here on Earth, at least we have a starscape to gaze upon when we look up into the night sky. Sources: Discover, Accelerating Future, Genesis Mission. Top image via Richard Powell, inset image via Accelerating Future.